BellHawk Systems' Barcode Inventory Tracking Service (BITS) is a low-cost, easy-to-use, system that uses license-plate tracking methods combined with barcode scanning and mobile computing technology to perform material, inventory, warehouse, and stock room, and asset tracking. BITS can also be used to track the flow of serialized items through a sequence of manufacturing, repair, or test operations. BITS is designed for use in manufacturing, engineering, construction, laboratory, medical, and maintenance organizations as well as in warehouses and distribution centers that do kitting, repacking, labeling and need to generate advanced shipment notice data for supply chain integration using EDI. BITS has special capabilities for tracking Government Furnished Equipment (GFE) and Customer owned materials. With the Project option, it can also track materials on separate projects and keep them separated. BITS gives a real-time view of the status of inventory and work-in-process flow as well as the status of assets such as tools, jigs, and fixtures. Management users can also print out reports or obtain Excel exports giving the status of inventory and which items have fallen below planned minimum quantities. The major benefit of BITS is that inventory can be tracked in real-time at multiple geographic locations including in warehouses, stock rooms, construction sites, manufacturing plants, and field maintenance sites. Another major feature is the ability to track parts having different lengths and widths and attributes such as color using a common parts number. This enables the tracking of offcut materials, as well as dramatically reducing the item master records that need to be setup. 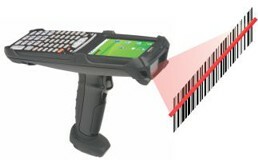 Data collection can be performed with wireless mobile computers or PDAs, equipped with integral barcode scanners, as well as with fixed station PCs equipped with barcode scanners or Android tablets equipped with cordless Bluetooth scanners. Entry into inventory and withdrawal of materials by part number, lot number, serial number, and expiration date. Real-time tracking of the location and movement of materials, including the movement of inventory between facilities and movement of materials to construction sites and return from site. Receipt and tracking of materials in barcoded bins or shelves, and in/on barcoded boxes, reels, rolls, barrels, and pallets. Receipt and tracking of serial numbered assets such as tools, jigs, and fixtures. Issuance of materials for production, assembly, or for installation and the return of unused materials to stock. Issuance of tools, jigs and fixtures and other assets to people or jobs and their return to stock. Barcoded tracking of nested containers such as boxes on pallets. Packing and shipping of materials to customers. Movement of serialized items from production operation to operation.